Opinion Forum » Is Obama an Apologist? In a word, yes, in that apology has become an important part of the way he conducts his foreign policy, even with countries who currently harbor a deep-seated hatred towards America. The right has taken up arms and decided that the word “apologist” will become their newest focus of attack on Obama. Beneath these attacks is the insinuation that the president has some sort of America-shame that causes him to go around to foreign dignitaries apologizing for every perceived injustice our country has ever committed. While apologist may be an apt term for Obama, one question no one seems to be asking is, are his apology-repeating tactics relevant? Will this change in attitude actually have any effect on the political situation in the countries he apologizes to? I have to argue that they will — but not in a positive way. It’s time to move away from name-calling and psychological analysis of Obama’s strategies and see where his foreign policy apologies will lead. Countries are going to have interests, and changes in foreign policy approaches by my administration aren’t suddenly going to make all those interests that may diverge from ours disappear. What it does mean, though, is, at the margins, they are more likely to want to cooperate than not cooperate. If Obama himself recognizes that his policy of friendliness towards government-consolidating dictators isn’t likely to make them quickly change their approach towards freedom and democracy, then what does he expect to bring? Chavez’s qualms with America aren’t exactly at the “margins” — they’re an integral part of his stance and as a leader. Such friendly handshaking sends a message to the world that this sort of government is fine with America. And, while other countries follow our lead and become more accepting of governments of the likes of Chavez, the people inside the country lose their allies on the outside. Without pressure from more powerful nations, Chavez isn’t going to change his tune; he’s going to continue his current consolidation of power. 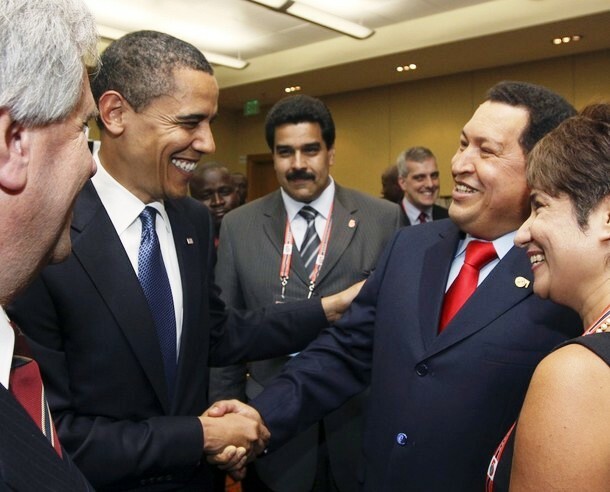 While it might make Obama feel all warm and fuzzy inside to spread his smile and handshake around the globe, the oppressed citizens inside countries like Venezuela aren’t going to be thanking him for his goodwill. Joy Paley is a science and technology writer based in Berkeley California. She enjoys blogging for My Dog Ate My Blog and also writes about accredited online universities for the Guide to Online Schools. Nicely done, Joy. Obama’s “world apology tour” certainly has not paid off in heightened respect for the United States. And you hit the nail on the head in regard to what his cozying up to dictators does to the people they oppress. And here’s a supreme irony: Barack Obama, who received the Nobel Peace Prize for … well, nothing … hosting the President of China for dinner while China has a fellow Nobel Peace Prize laureate in prison.